Separating larger biomolecules (i.e. proteins such as antibodies, enzymes or larger nucleic acids) from unwanted smaller molecules. Buffer exchange, desalting, removal of low molecular weight contaminants, and reaction terminations. 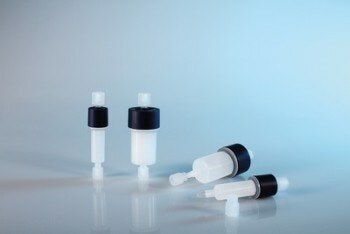 Simple, rapid and reproducible separation using a syringe, pump or liquid chromatography system. The fractionation range for globular proteins is between 1 and 5 kD. The size exclusion cut-off is approximately 5 kD, which ensures efficient separation of proteins/peptides/biomolecules larger than 5 kD from lower molecular weight molecules of less than 1 kD. ZetaSep Desalting FPLC Columns contain Zetadex-25 Superfine, a beaded composite size-exclusion matrix manufactured by emp Biotech in Berlin-Buch. It exhibits high flow rates, excellent resolution and chemical stability. Buffer and pH effects on resolution are minimal.